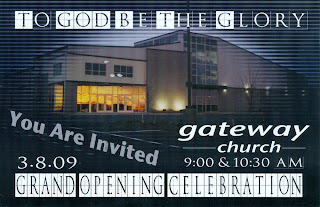 Gateway Church, a Grace Brethren church in Parkesburg, Pa., is marking the grand opening of their new building at the corner of Cowan Road and West Lincoln Highway on March 8. “Our goal has always been to serve people and help them connect to God, each other, and the world,” says Pastor Dan O’Deens. The 21,000 square-foot-building, constructed as a community center, include a multi-purpose space for services, concerts, and family events; a fountain and baptistry; and space for nursery, pre-school, and elementary-age classes. The grand opening celebration will be marked at two services… 9:00 and 10:30 a.m. … on March 8. For more information, see www.gcwired.com.